Celene had quite an adventurous childhood. Her journey started in Savannah, Georgia, where she was born. From there, she moved to Michigan, then Texas, and then finally to Cleveland, Ohio. Although her movement from state to state has ceased, she ended up moving one more time within the state to pursue her bachelor’s at The Ohio State University in Columbus. Celene ended up staying, and is now enrolled as a first-year graduate student in Food, Agricultural and Biological Engineering. Born to native South African parents, she is her family’s first generation American. Celene credits her childhood traveling experiences to her parents’ job opportunities. Because there was no reason for them to stay in one place, they enjoyed discovering new environments and experiences. “Why not seek what this place has to offer?” Celene said. When applying to Ohio State, Celene was accepted into the Honors & Scholars Eminence Fellows, joining the program’s second ever class. As a part of the program, students must work together to organize a four-year undergraduate service. Celene was able to develop great bonds within the group and from this experience. She felt lucky to have been in a class that was united. “They want to use their education for the greater good of the future, the community, and the world,” Celene said about the program and her former members. Celene did a lot of exploring during her first few semesters at Ohio State. Coming into the university, she wanted to pursue chemical engineering. Upon familiarizing with the major and its facets, she realized that the major was too broad. Her interests fell more into food engineering. It has the same fundamentals as chemical engineering, but it specializes in what she’s really captivated by: the fermented/alcoholic brewing industry. 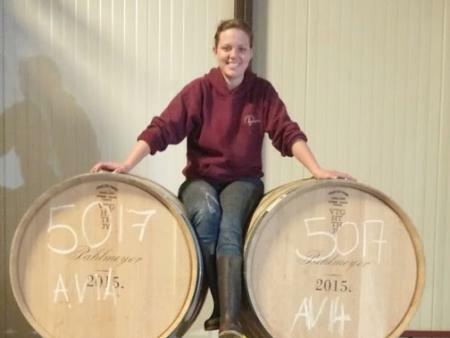 Her fascination in the alcohol industry stemmed from her visit to a winery in California with her parents in 2014. With the engineering thought process in her mind, she analyzed everything she saw there. Her unorthodox interests have led to her unorthodox internships. Celene went on quite a venture to find her first job, applying to over forty different wineries during her undergraduate (and underaged) years. Despite not hearing back from all except three places, she remained hopeful. She eventually got accepted at a local winery in 2015. The winery was not an easy place to work. Celene served as a harvester, taste tester, and a grape crusher. Her days started at five in the morning and worked 14 hours every day. After the winery, Celene acquired a job a bit different from her first experience. At a little craft brewery, she worked as one of the three shift brewers. Employees at the brewery had to climb high ladders (conquering her fear of heights) and forklift 45-50lbs of different types of purees into a 30-barrel fermenter. A memorable experience during her time at the brewery involves guava puree spilling heavily down the sides of the fermenter. She was also able to design and experiment with her own drinks in the laboratory. This internship inspired her to start experimental brewing in her own home. Not only does Celene like to homebrew, but she also loves to make desserts and treats at home. She has explored lots of unique desserts, including choux pastries and macarons. “I get a little ambitious for someone with a studio apartment,” Celene said. In addition to culinary arts, Celene has talent for the fine arts as well. Celene loves music, especially performing it. She started her oboe career in sixth grade. During her first couple semesters at Ohio State, if she wasn’t in her private lessons, she found herself practicing in the oboe studio. She initially wanted to pursue a minor in music but decided to focus on her engineering major instead. Celene also finds peace in visual arts. She specializes in printmaking: building an image on a medium and transferring it to a piece of paper or cloth by carving out the positives and inking the negatives or vice versa. She believes that if she was not pursuing food engineering at Ohio State that she would be in art school. “The squeaky wheel gets the grease,” Celene quotes. She wants everyone to know that it is okay to go after something that isn’t traditional. Students would be surprised by what they are capable of once they step out of their comfort zones. Celene encourages people not to take no for an answer and not to feel discouraged when a hardship comes along; instead, they should use that challenge as motivation to work harder.